Copycat Trader Joe's Gone Bananas! Copycat Trader Joe's Gone Bananas is one of the simplest recipes on the blog, and one of the most outrageously delicious frozen desserts you'll ever eat ~ these frozen banana slices dipped in dark chocolate are healthy, too! Slice the banana and place the slices on a tray. Put the tray in the freezer until the bananas are frozen solid. About an hour. Meanwhile place the chocolate chips and the coconut oil in a small microwave safe bowl or measuring cup. Microwave for 30 seconds and then stir. Microwave for another 15 seconds and stir again, until all the chocolate is melted and smooth. Put it back in the microwave for another few seconds if necessary. Don't over heat. Set the chocolate aside to cool. 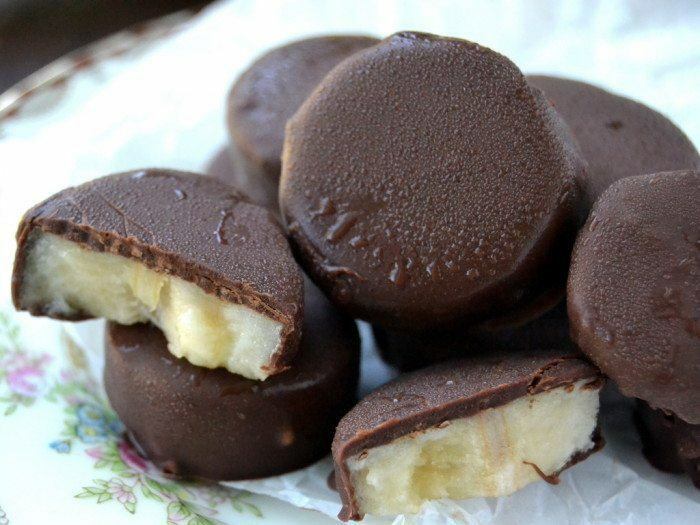 When the bananas are frozen, dip them into the cooled chocolate and coat on all sides. I like set the slices on a fork and then use a spoon to help drizzle the chocolate all over. Let any excess chocolate drip off before setting the slice down on parchment or waxed paper. Put the slices back in the freezer right away. You can store the slices in a zip lock freezer baggie once the chocolate has hardened.